I am so happy for my friend, Yusni. She’s just opened her yoga studio, Jakartadoyoga, in the heart of Jakarta, a life-long dream of hers. I went there last Saturday during its soft launch titled “Walking meditation and yoga all day long,” in which she held a walking meditation to a near-by park, held a yoga session in the park and five other yoga classes at her studio during that day. A neat and appropriate way of launching a yoga studio. What I love about Yusni, her studio, and all other events she holds is the fact that you feel like coming to your friend’s event,. You don’t really feel like there is any distance between the organizer and the participants. And you can feel Yusni’s enthusiasm towards yoga. I come to the studio and feel that the owner of the place has put her heart and soul into preparing and managing the studio. So, here’s to Yusni, her studio and all the yoga enthusiasts in Jakarta or anywhere else in the world. Kuddos. For further information, visit www.jakartadoyoga.com, email studio@jakartadoyoga.com, or just drop by Jl Sunda No 7, 3rd Floor, Menteng. This entry was posted in recommendation on November 28, 2007 by Eva. Microsoft Indonesia and USAID-financed competitiveness project SENADA today launch iMULAI, a national competition and awards program for innovative solutions for business. The program aims to promote the spirit and importance of innovation among Indonesian business entrepreneurs and support the establishment of Indonesia as a competitive, knowledge-based economy. The competition, which will run until December 31st, 2007, is open for all Indonesian businesses (both start-up and established) and non-government organizations. iMULAI will select three winners whose proposals show the most promising innovations and which promise the greatest potential impact on the information technology and communications industry in Indonesia. Each successful innovation will receive over Rp145,000,000 in hardware and software business technology from Microsoft and Rp220,000,000 in grant financing from SENADA for innovation costs. For more information, visit the iMULAI website. 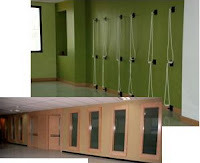 This entry was posted in recommendation on November 22, 2007 by Eva. I over indulged during the weekend. So now it is pay back time. Nils, you would be proud to know that no animal has been harmed during the production or the consumption process. This entry was posted in personal on November 19, 2007 by Eva. [Once upon a time, my friend Hanny and I had our writer’s block. Then we decided to write in each other’s blogs instead. I know nothing about spirituality, meditation, or yoga, or those wonderful things that close to your heart. However, as agreed, let’s play Athena in The Witch of Portobello, and I’ll try to start talking about things I know nothing about. About a year ago, out of nowhere, I decided to use the word ‘splinters’ when I’d like to go anonymous with my writings. I fell in love with the word in high school, when I found it inside a poem by Edith Sodergran, The Stars. Do you think Edith was ahead of her time? Do you think she resembles Coelho’s Athena—The Witch of Portobello? Anyway, I don’t want to think of it as a coincidence, but if you look up for the word ‘splinter’ in the dictionary, it means “a small, thin, sharp piece of wood, glass, or similar material broken off from a larger piece”. What if the larger piece is the universe, Eva? What if I’m a splinter of the universe? What if we’re all splinters of the universe? We are, aren’t we? So now it’s not that hard to imagine that we’re connected to each other in some way; that we’re capable of doing noble things; that our minds are magnetic and able to draw things we cherish closer to us; that we’re capable of revealing the secrets of the universe, one at a time. And this, Eva, this is what I called spirituality. Something that we’ve already had inside of us since birth, running through our veins and pumping our heart; but we kept on searching for it in those long and tiring journeys, only to find out that we’ve never losing it at the first place. [I didn’t change a single letter, Han. I did not need to. This entry was posted in friend, quote on November 19, 2007 by Eva. It was late at the office. The room was getting dark. I kept staring at my computer’s monitor until it was time for me to go. I turned around to look at the window, just to see how the traffic was. And I was in awe with what I saw. 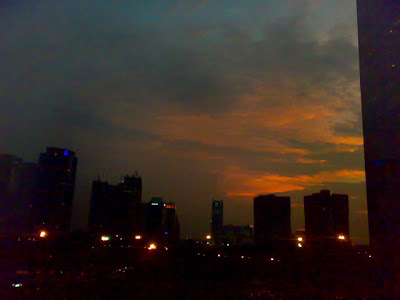 An orange sky above the darkened skyscrapers of Jakarta. The view had always been there to entertain, yet the only thing I stared at until that moment was my computer. Things we are able to see if only we change our point of view. This entry was posted in occasion on November 17, 2007 by Eva. This month I have been blessed with encounters with two teachers. People whom I believe have earned their rights to be called teachers. People with such ample amount of knowledge and skills but still manage to be so humble, ordinary and willing to reach out. 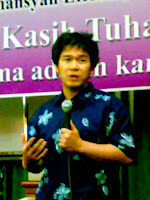 Pak Budi. A craniosacral therapist. I was introduced by a friend. I went to his house one night where he held his meditation session. You could not really tell which is him because he just blended with others. The (about) 10 of us chatted for a bit and meditated. Pak Budi then answered all questions asked and even treated one participant. Pak Irmansyah Effendi. Founder of Reiki Tummo. I took several classes of Reiki Tummo several years back but never really got into it much. A friend YM me one day and said that there will be an alumni gathering with Pak Irmansyah as the speaker. Interesting. I sat at the first row. The speaker had not arrived yet. Then this rather young guy with untidy hairs and blue-white Hawaiian shirt came and started to set up the notebook and laptop. A lady next to me said “Pak Irmansyah?” and he smiled. My god, that’s Pak Irmansyah? Wow. How come he is so ‘ordinary’? I thoroughly enjoyed both session held by Pak Budi and Pak Irmansyah. On a ‘sadder’ note, I have “lost” another teacher this month. Pak Pujo who passed away late last month. I only met him once but he has left such a deep impression to me. His passing made me think about that only time we met. I am sad that I do not have the opportunity to meet him again but thankful for that one time we have met. People with great wisdom and such humility. Those people have earned the rights to be called “teachers”. And I am thankful for the opportunity to meet them. Judging by the number of teachers I have met in such a short time, I supposed it is school time again. I look forward to become a student.